On Tuesday, our measly little Internet radio station started experiencing a 500% increase in traffic. I was baffled until I noticed that most of the new listeners were using Apple’s iTunes. Sure enough, I don’t know who replaced Kerbango in providing iTunes’ Internet Radio listings, but they now feature Radio Free Tiny Pineapple in their Eclectic category. In fact, RFTP represents 3 out of the 12 Eclectic streams in the listing. At the end of the walled garden in Dunmore Park is The Pineapple. It is a folly par excellence, a stone fruit to revitalise the most jaded architect’s palate. This gigantic reproduction of the now familiar fruit dwarfs the surrounding trees, the most singular monument to come out of the little practised art of fruit architecture. In 1761 the twenty-nine year old John Murray, fourth Earl of Dunmore, had been married two years. Perhaps it was his marriage going sour that prompted the enormous fruit; or was it intended as a belated wedding present; or the result of a frivolous wager; or to commemorate the growing of a pineapple (not the first — they had been grown in hothouses in Scotland for nearly thirty years), but whatever the reason, this extraordinary building never fails to astonish. The building was planned and designed with the utmost care, with each of the gently curving leaves being drained separately in order to prevent frost damaging the delicate masonry. There are two entrances: a classical loggia to the south and a Gothick doorway to the north on the upper level, leading into the second storey. The keystone above the south entrance carries the date 1761, and above this is a carved heart and the inscription “FIDELIS IN ADVERSIS,” commemorating the marriage of George Murray, the fifth Earl of Dunmore, to the daughter of the Duke of Hamilton in 1803. Some years ago the Landmark Trust took the building on a long lease from the National Trust for Scotland and carefully restored it for letting as a holiday home. 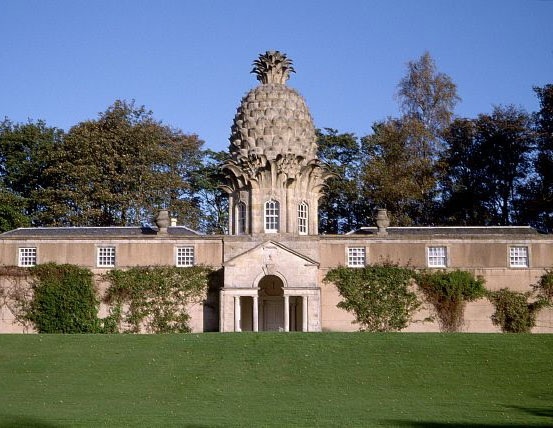 A hermit’s cave has been reported nearby, so perhaps the Pineapple was not the only Dunmore folly. Sadly the name of the designer of this wonderful structure has not been recorded — it is a work of genius, certainly unique and probably impossible to duplicate nowadays. Tradition ascribes it to Sir William Chambers, but he was working in London at the time it was built and it is not mentioned in his writings, as such a remarkable building surely would have been. 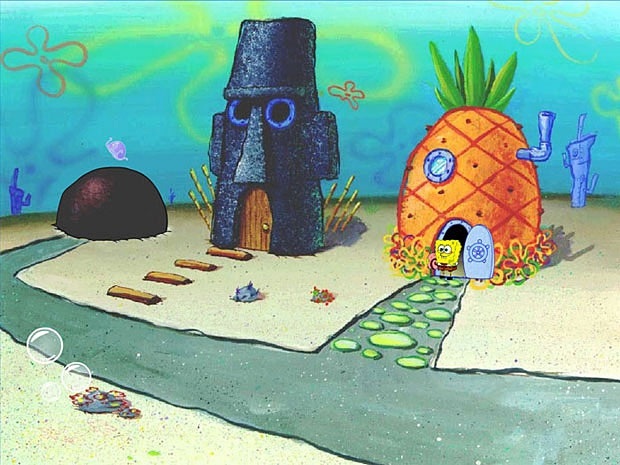 O-hhhhhhhhhh……Who lives in a pineapple under the sea? Absorbent and yellow and porous is he! Then hop on the deck and flop like a fish! SpongeBob SquarePants! SpongeBob SquarePants! SpongeBooob SquarePaaaaaaaaaants! As street folk watched me pass. That life was an ocean vast. That my thoughts for you now are impure. As my heart sweeps the streets of love. And thought of your eyes so blue. Of our meeting and transmitting germs.